Professional Design Associates, a consulting electrical engineering firm headquartered in Downtown Henderson, is the electrical engineer for a vivarium at UNLV. A vivarium (Latin, literally for “place of life”; plural: vivaria or vivariums) is an area, usually enclosed, for keeping and raising animals or plants for observation or research. 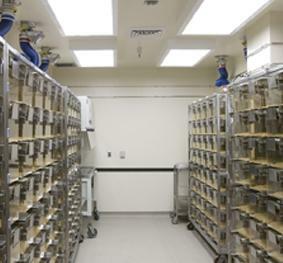 At UNLV it will primarily be used for their lab mice. Did you know that the mice cannot see the color red? The lighting in their holding rooms is controlled as a circadian rhythm, to mimic the day/night light cycle. The scientists can adjust the duration of the day and night cycle to model different seasons and locations on the planet. The lighting dims up and down over 30 minutes to replicate the dawn and dusk transitions. When a room is in the night cycle, and the researcher needs to do something in the room, red lights can be turned on so they can work and see what they are doing, without disturbing the cycle, since the mice can’t see the red light. This is important because, among other variables, the circadian rhythm affects the melatonin produced by the mice, which in turn can affect the outcome of an experiment. In order to preserve the integrity of the research, the entire facility will be backed up by an emergency generator, including the lighting, computers and heating, cooling and ventilation systems.